Here is your chance to try out su:m37° Secret Essence! Secret Essence is the luxurious representative product of su:m37° that creates visible firmness, and minimises the appearance of fine lines and wrinkles, delivering a glowing & youthful-looking complexion. Its high concentration of fermented ingredients with 86 natural plant extracts undergo the metabolic Ferm Origin Process™ over all four seasons of the year, removing any toxins that may be present in these plants. 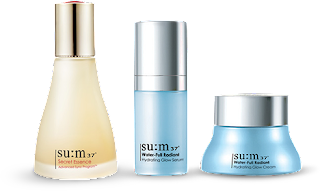 This process boosts the moisturising and antioxidant properties, reducing the essence down to the same viscosity as the skin cells increasing the penetrating ability of the Secret Essence by 5 times compared to any other essence of su:m37°. How to claim your 3-day trial kit? voucher (sent to you via email) to one of our beauty experts.